The bottom line is that performance matters, a 1 second delay in page load time results in a 7% loss of conversions. Your website is critical to your business success, and must support your business initiatives. It’s also become much more complex and involves many moving parts. 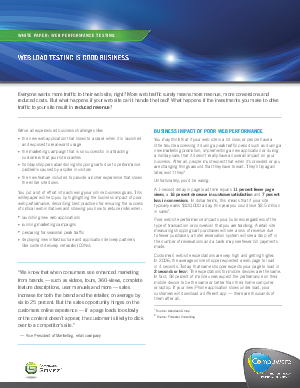 Load testing helps you extend control, mitigate risk and ensure great customer experiences. Load testing your website across the entire Web application delivery chain will enable you to find and fix problems before they impact customers and will help make your most critical ebusiness initiatives successful. Today’s on-demand cloud-based load testing makes it affordable and easier than ever. Continue reading to learn more about how important web load testing is.